Our goal at Plivo is to simplify business communications. And, that philosophy applies not only to building and deploying but also to tracking and debugging. We aim to give our developers best-in-class debugging tools to enable you to spot and fix bugs faster than ever. Based on input from our customers and an internal system audit, this major update includes 9 feature updates. Destination country: A new field which displays two-character country code has been added. When you hover on the two-character code, the complete country name is displayed. 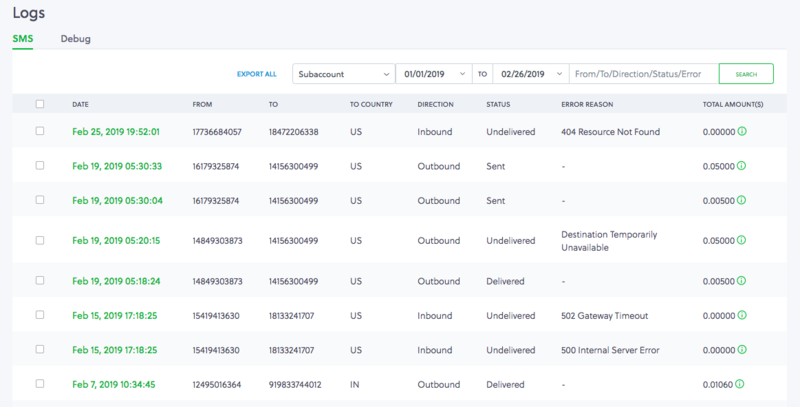 This helps you quickly identify potential text misroutes which may be caused due to missing country code or incorrect destination number format. SMS error reason: Now you can quickly identify the cause of any failed incoming our outgoing SMS messages. Check carrier errors as well as message callback errors. You can also filter the logs based on destination or message state, giving you a telescopic view that helps you more efficiently detect potentially larger issues. Carrier surcharge: Carriers in certain countries have a passthrough fee. This fee is charged by the destination carriers to receive MT (Mobile Terminated) and MO (Mobile Originated) messages. This is in addition to the cost of sending or receiving the message. Hower on the information icon next to the SMS charge would display this information. Sub-account filter: You can now filter the SMS logs in your account based on each sub-account. This provides more visibility and helps pinpoint issues which are specifically affecting a particular end user segment. Downloadable information: The existing information, as well as the new addition on message detail record (MDR), would be part of downloads in the form of CSV in your account. This upgrade includes an all-new SMS detail page. Click on the timestamp for a text message under SMS logs and you are transported to a detailed information section which is specific to the text message. Here are the highlights from the page. Message text body: The fully formatted message body is now clearly displayed on the debug UI. You no longer need to dig through server logs to retrieve the message. Note: If you’ve redacted the message content, it will not be visible on this UI. To know more about message content redaction, check out our earlier blog here. Number based filter: Click on the source number or destination number related to the text message and you would be redirected to SMS logs with the concerned number set as a filter. You can filter all messages which have originated or terminated to the number in question. 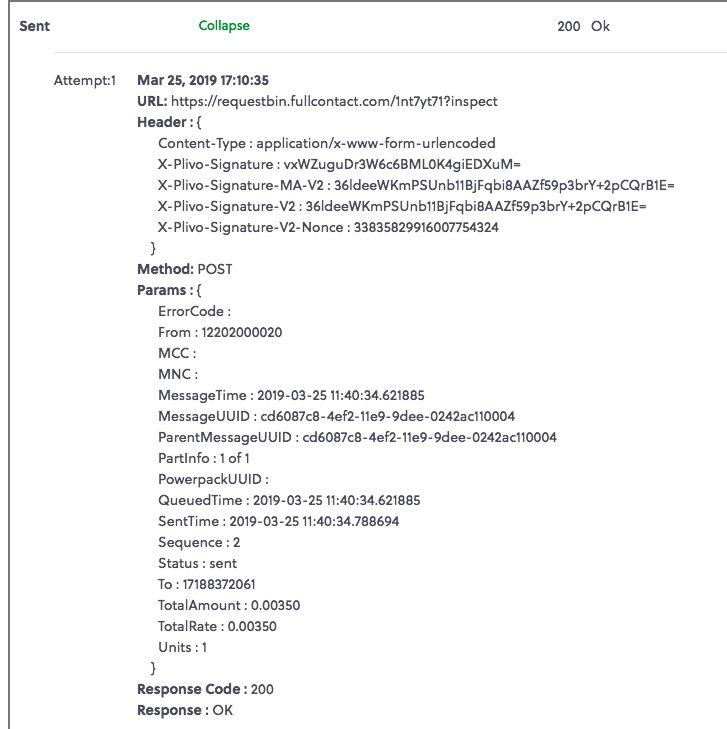 SMS Callback Attempts: All HTTP callback requests made by Plivo to your endpoint in relation to the SMS are now clearly listed on the Debug UI. This feature visually represents message state transitions, along with the time delay between states. This helps you get complete visibility into the lifecycle of the SMS. Metrics such as time spent in the queue will help identify bottlenecks in your SMS traffic pipeline. In the example above we can easily determine that the SMS was in the queue for 497 milliseconds and was finally delivered to the recipient 2 seconds after leaving the Plivo system. To access the new features, go to the Console and click on an SMS in the MDR list. If you are new to Plivo, Sign Up for free now, and start building your communication application in minutes.